Yes, Kenji won BOB both days, Trixie won BOS for another point on Saturday. 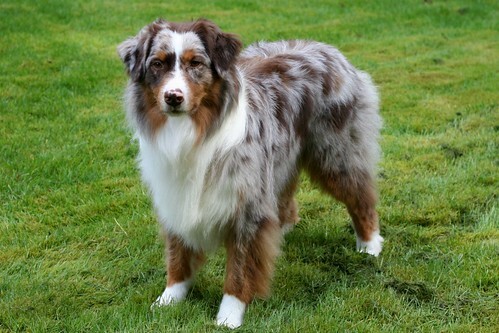 But the big news... and the dog that really deserves the spotlight because he just doesn't get enough recognition in a house full of shibas...is that Timber, my australian shepherd, qualified both days in Rally-O. On Sunday, he not only qualified, but won a 4th place ribbon with a 97 out of 100 score. I'm so proud of my boy!!! And by the way, it's his third birthday today, so he gets extra hugs and kisses and a nice big chewy. 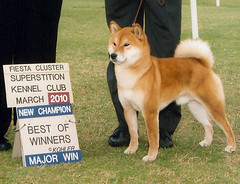 Not to overshadow Timber's success on his birthday, but here is Kenji's photo winning his championship in Arizona. Finally got the photos.